Renowned Russian painter Damir Krivenko brings his new and innovative direction to the Strand Gallery this June in the thought-provoking exhibition, For Our Time’s Sake. 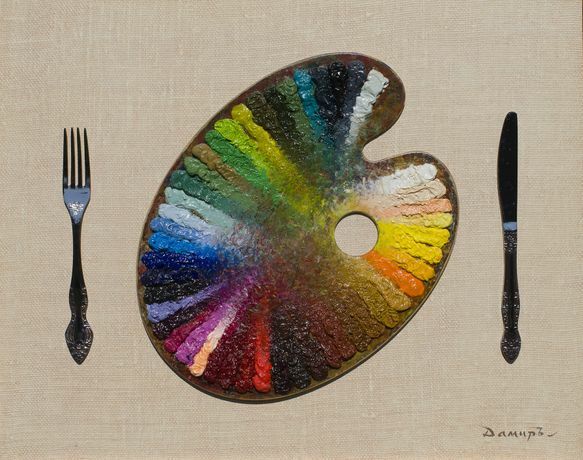 Renowned Russian painter Damir Krivenko brings his new and innovative direction to the Strand Gallery this June. The thought-provoking exhibition, For Our Time’s Sake, features new paintings which explore the relationship between classical and contemporary, giving way to narrative about technology and eternal values of humanity. In his London show, Krivenko presents a series of unique works united by the common idea of the popularisation of art. At the core of this project lies the difficult task of fusing realism with avant-garde. Nonetheless, it is a way, Krivenko believes, that shows best how the energy of art can act as a reviving and unifying force. The symbol of this exhibition is the humble palette – a permanent witness of the everyday work and spiritual becoming of any person who picks up a brush. The 20 works in the show combine traditional imagery with elements from 21st century technology. Krivenko skillfully weaves into the narrative pieces of computer systems, pearls, fragments of palettes and other unexpected objects. Through his fusion of past and present the artist analyses the evolution of artistic styles and culture and appeals to a wider audience. 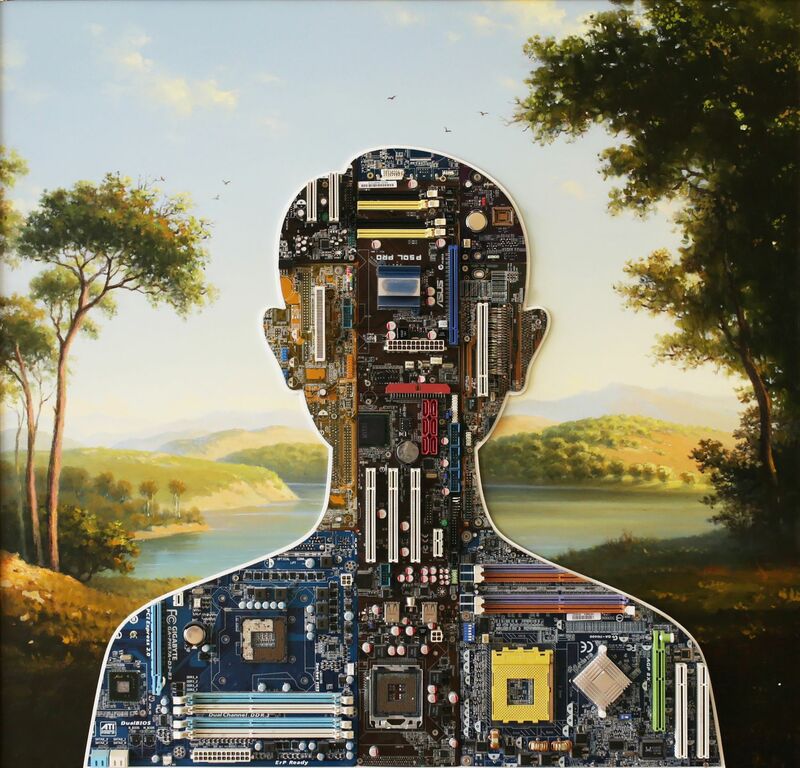 In “Gamer” the artist contrasts a realistic landscape painting with the silhouette of man, whose features have been replaced with computer parts. This piece clearly outlines Krivenko’s exploration into the evolution of humanity against the background of the eternal nature. 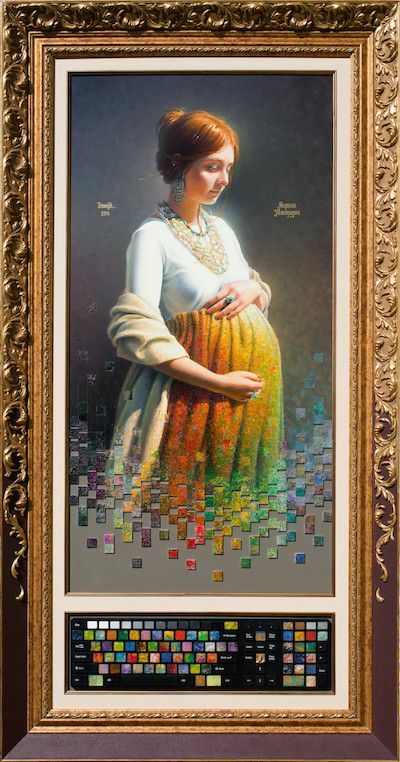 In the work “Madonna of Palettism” a beautiful pregnant woman is encompassed by a celestial glow, her maternal portrait embellished with a computer keyboard and multicoloured keys. A commentary on societies data footprint and responsibility to use technology wisely; our momentary actions are imprinted forever online and can reflect on the lives of our children and grandchildren. Krivenko’s works highlight the desire to shake up old traditions, better understand societies’ values and how people’s perception of themselves and the world around them changes over time. He aims to draw the viewer closer through these new works, to look beyond the expected and is committed to increasing the accessibility of art, promoting non-elitism. Born in Leningrad to a dynasty of artists and art historians, Krivenko grew up in Kazakhstan where he graduated from the Almaty Art College in 1992 and shortly after become the principle curator for the President’s office, organising exhibitions at the Dostyk Gallery. The exhibition was made possible by the kind sponsorship of Fanagoria, an Award Winning Russian Winemaker. The show is part of their Cultural Program, which has supported a number of art events across Russia, helping artists develop in their respective creative fields.